The oh-so-easy to press panic button at Chelsea still hasn’t been called into action, but worried minds are contagious. Still, it’s hard to expect Maurizio Sarri to conjure magic, especially when his football philosophy is very different than what Antonio Conte implemented in two years at Stamford Bridge. Sarri’s Chelsea didn’t look anything like a team prepared to reclaim their spot among the Premier League’s elite, missing out on a top 4 finish for the second time in three years last season. The team was outplayed by champions Manchester City in the Community Shield match, conceding twice from Sergio Aguero. For those worried about the result and ability, the Twitter page SSC Napoli News had a reassuring message: Sarri didn’t do that well early on at Napoli too. The Naples-born manager led the club to just one win in his opening five Serie matches. That was followed by nine undefeated matches and overall, two 2nd place and one 3rd place finishes. In a league dominated by Juventus since 2011, that’s about as much as you can ask from the man on the sidelines. 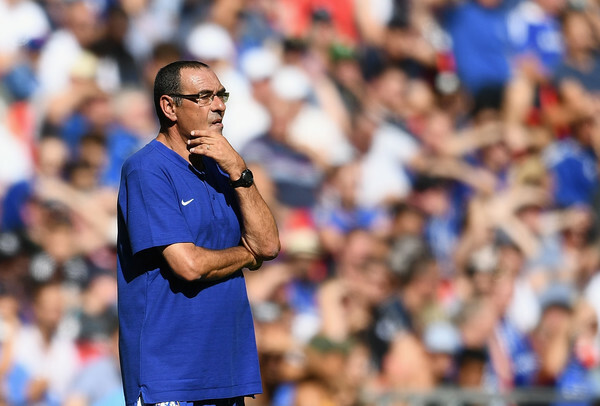 The problem for Sarri is often the finish, but right now, he needs to hope he’ll last that long – Chelsea isn’t exactly run by the most patient of people regarding managerial credit. With the Belgian duo of Thibaut Courtois and Eden Hazard reportedly looking to leave; with Jorginho of Napoli the only new arrival to a league he’s never played in before; and when the transfer deadline is only a few days away, Sarri is going to need a whole lot of patient from his boss and the fans.